It stands in supreme isolation, alone along this little stretch of the river, like a mouth with but a single tooth. 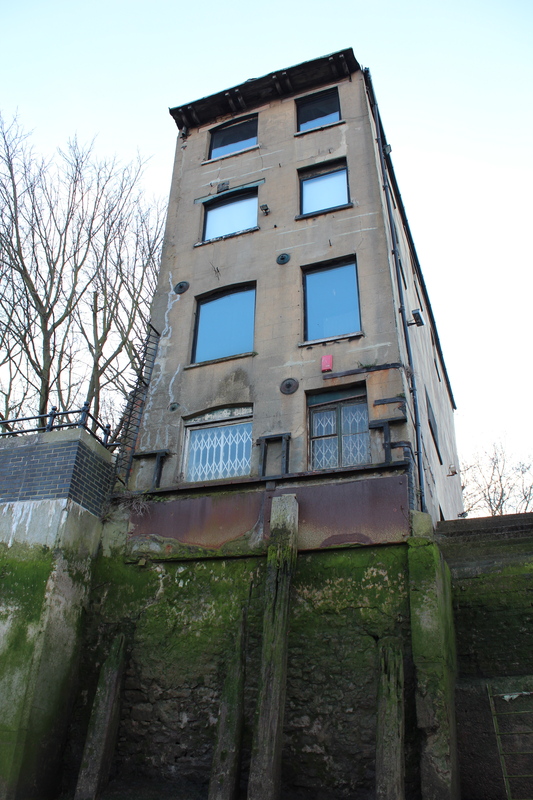 How many travellers along the Thames must have wondered about this funny, narrow little building in Rotherhithe? 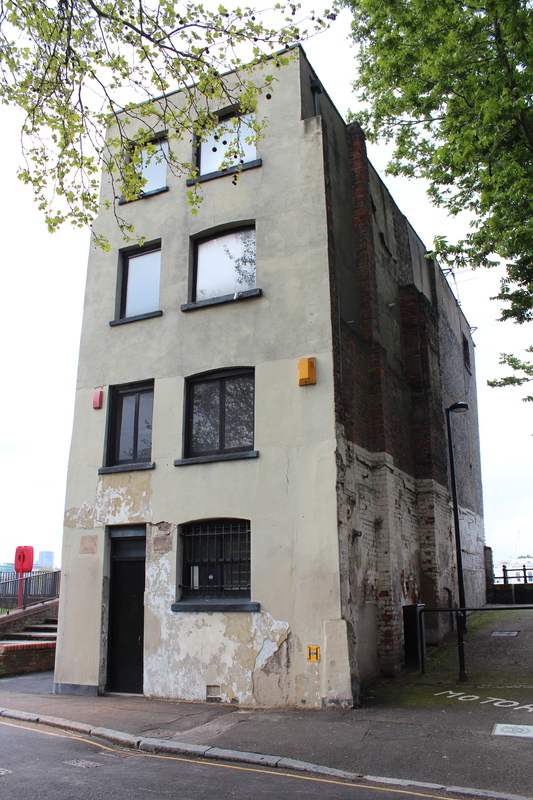 In fact, the Leaning Tower of Rotherhithe – as it is apparently known locally – was one of several buildings in the area owned by Braithwaite & Dean, a barge company. They were a lighterage firm – lighters being flat-bottomed barges – and their lightermen moved goods between ships and quays (not to be confused with watermen, who carried passengers). 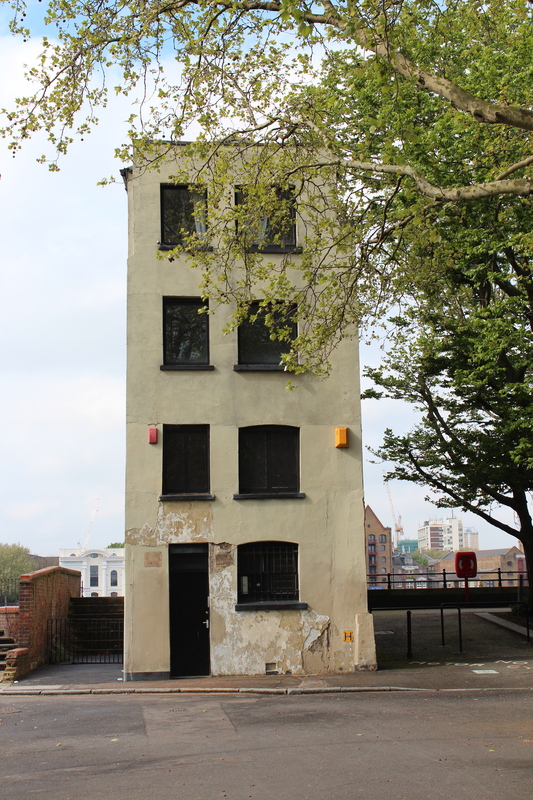 This building was their office – and already tilting back in those days – where lightermen would pull up in their boats to collect their wages. Once this whole stretch of the riverside was covered with buildings, mostly related to shipping, with a few public houses thrown in for good measure. You can see a Museum of London photograph of the area (commissioned by the Port of London Authority as part of their ten-mile panoramic documentation of the river) from 1937 here. The buildings to the west of our leaning tower were purchased in 1939 by Bermondsey Council, who planned to demolish them to build a garden. The Blitz then finished off any work that they had begun to this end. To the east of the building stood what has been described as ‘a once absurdly picturesque row of largely wooden tenements…seedy in the extreme but vibrantly populated in the 1950s by a bohemian set of artists and writers’. 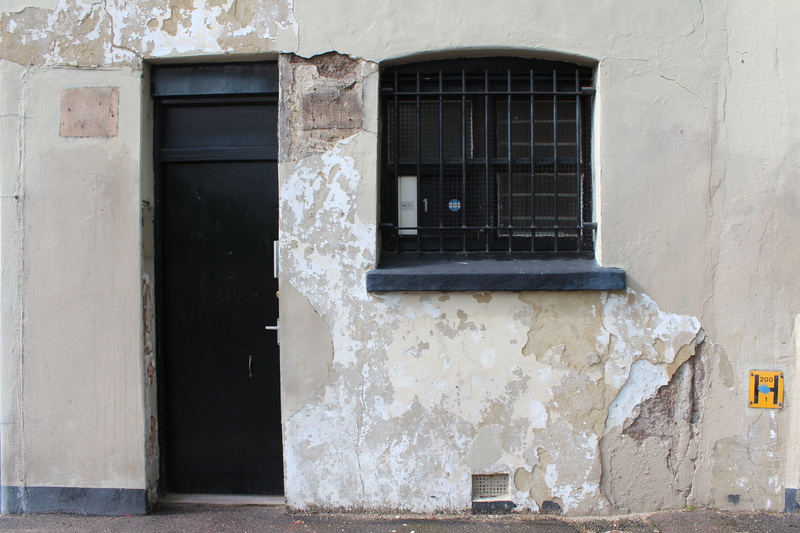 Lord Snowdon lived along this row in a former coal store and is said to have met with Princess Margaret here, as well as hosting celebrities such as Marlene Dietrich and Noel Coward (who entertained him on the piano in his studio flat). In around 1960 he lent his room to John Betjeman (as you do) when his house burnt down. Betjeman described his time here as ‘the most restful few months I had ever spent in London’, during which he enjoyed the ‘tremendous view’, including that of ‘the wharves and Georgian brick buildings of Wapping’ across the way. He moved the bed to the river-side of the room, going ‘to sleep to the solacing sounds of water’. At low tide he would listen to the sound of the waves rippling over the pebbles below, and described how at high tide ‘after a tug had passed the water made a plopping sound right against my bedroom wall as thought I were in a ship’s hold’. Until the Thames Barrier was built this whole area was of course subject to the risk of flooding; Braithwaite & Dean’s offices were flooded in 1953. The remains of Edward III’s manor house nearby. Despite a campaign by both Betjeman and Snowdon, the rather romantic-sounding row of buildings to the east was also pulled down by the local council after being condemned as a health hazard during the 1960s. It’s not known exactly why this particular structure was allowed to remain. It is not of any particular architectural value, though perhaps it was its brickwork that saved it, as many of the other buildings were wooden so arguably less sound structures. 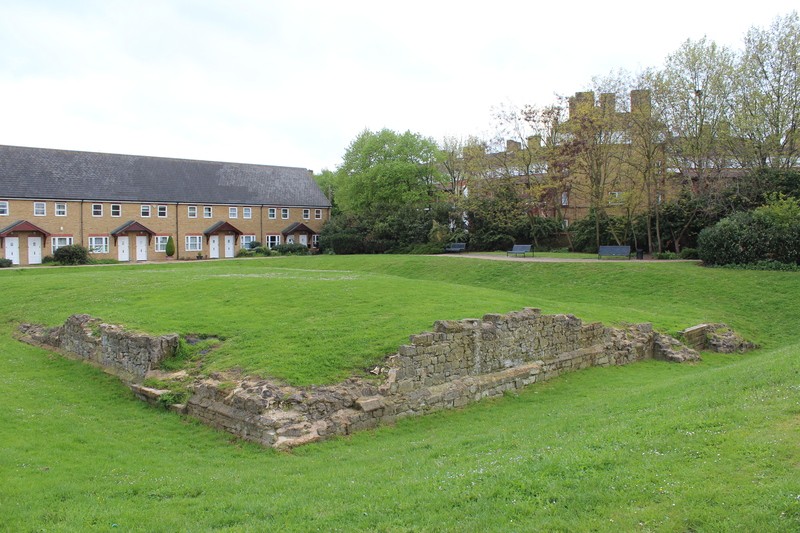 The King’s Stairs Gardens were then created here, and contain the remains of what is thought to be King Edward III’s manor house, circa 1353, uncovered by a Museum of London dig in the 1980s. Braithwaite & Dean stayed on in the leaning tower until the early 1990s, and it is now a (very) private residence. 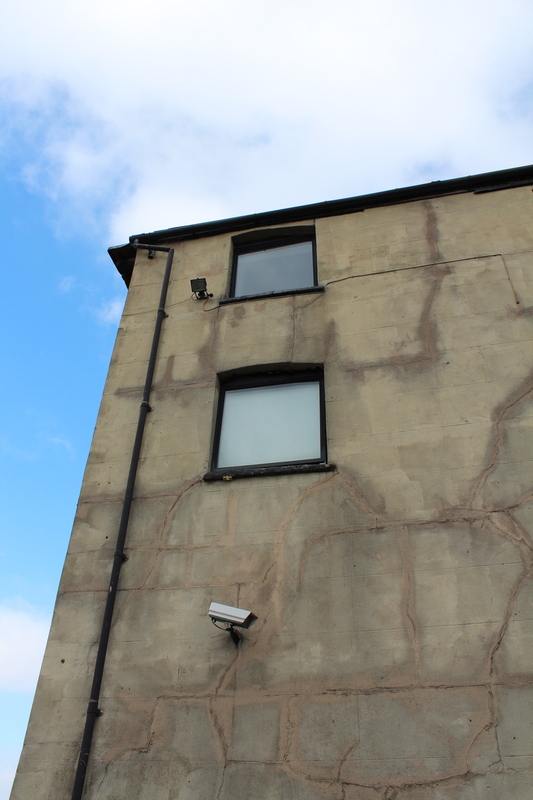 The house is located at the very end of Fulford Street (you can’t miss it! ), roughly equidistant between Bermondsey tube station and Rotherhithe overground station. 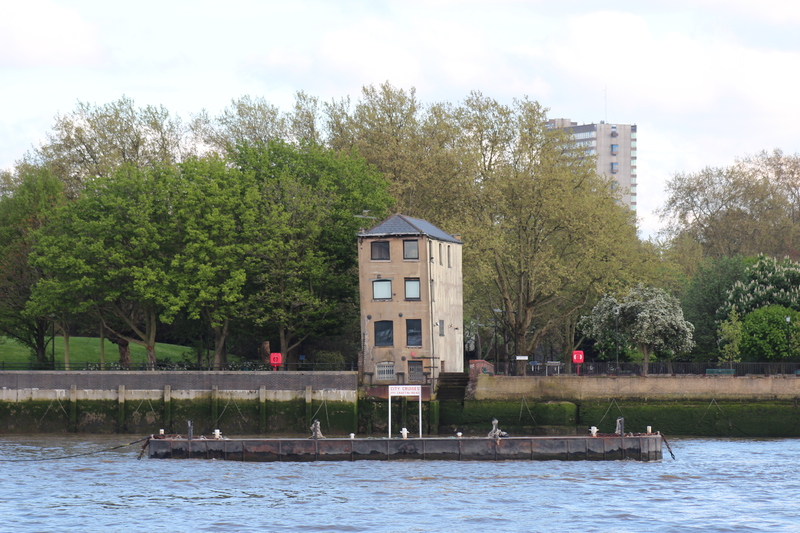 The photograph taken from across the river was shot (with a zoom lens) from Wapping’s Waterside Gardens. This entry was posted in History/heritage, Thames and tagged Betjeman Rotherhithe, Braithwaite & Dean, Leaning House of Rotherhithe, Leaning tower of Rotherhithe, lighterage, lightermen, narrow building on the Thames, Snowdon Rotherhithe by thelondonphile. Bookmark the permalink. Hello Londonphile – really like your piece about Rotherhithe. I was there at the weekend and visited the Brunel Museum. This is well worth a visit if you haven’t been already – in addition to the museum (which is small), my ticket got me into the original entrance shaft and chamber to the Brunel Thames Tunnel, currently used by the Overground trains. You can see what the original entrance looked like in the old prints of elegantly dressed people descending the stairs on either side of the drum-like chamber. It looks rather different today, and the chamber is blocked at the bottom so that the trains can pass underneath, but you get a good impression of how spectacular it must have looked in the early 19th Century. Entry has to be with the museum guide so phone ahead to confirm. Both afternoons include a guided a slide presentation and guided walk. Hello Steven, nice to hear from you. This is probably my favourite post too, and as it turned out the most popular so far. Yes I’ve been to the Brunel Museum and agree that it’s well worth a look, especially when you can go into the chamber (which I did). They now have cocktail nights in the garden on Saturdays in summer too! I’m already booked in for your October ‘Images of London’ course, and am very much looking forward to it having really enjoyed the last one. I may go on one of the walks too. Will definitely mention these on Twitter & Facebook for you too. A nice little article on Rotherhithe – thank you. I live just a few metres away from King’s Stairs Gardens and the Lighterman’s House, and indeed the house is owned by a friend of mine – it’s his little bit of heaven. You may not know that Thames Water have been threatening to destroy our park and demolish the Lighterman’s house to create an industial site for their Thames Tideway Tunnel. We in the Save King’s Stairs Gardens Action Group (of which I am Vice-Chair) have fought Thames Water tooth and nail to preserve the park and its unique house, and as a result the park is now a Site of Importance for Nature Conservation, is part of the Edward III Conservation Area, is a Village Green and a Queen Elizabeth II Field. The park has over 500 trees and Southwark have very kindly placed a preservation order on EVERY single tree. More info at our website SaveKSG.com. Thanks for that info Rob. I knew that the park had bene under threat but hadn’t realised the house was as well. Well done on achieving that victory – sounds like it was a tough fight. I’m more than a little jealous of your friend’s house! The very first draft of Thames Water’s proposal for their site at KSG said that the house was derelict and unoccupied, and they proposed to demolish it! Talk about a complete lack of research on Thames Water’s part – and we have dozens more such instances where their work has either been shoddy or deliberately misleading – their usual fault is the sin of omission, rather than outright lies. Their maps for instance have continually omitted to label a college/nursery, a nunnery and a brand new house which all abut the park. Sadly our fight isn’t yet over. KSG is still a back-up site for Thames Water’s new tunnelling proposal for Chambers Wharf half a mile upstream from the park. And although that is a brownfield site and therefore far preferable to our beautiful park, the residents there will experience hell for up to seven years. If any readers wish to sign our petition, it is still running at SaveKSG.com, where you’ll also find pictures of the park and the events we’ve held there. It is up to readers of this and other blogs to take action to preserve the beauty and characteristics of London, and to stop them being destroyed by barbarians like Thames Water. My Great Grandmothers maiden surname was Braithwaite. Her family were related to the original owners, they were cousins. The family originally came from Wapping. Hi Londonphile, I was born and raised in Rotherhithe in the 1950’s, so I am lucky enough to know how it once was, and have such happy memories. I now live in Kent, but still have family there and I visit often. I remember the Lighterman’s House very well, and also the story of Princess Margaret’s visits to Lord Snowdon before their marriage. I have also seen many changes in Rotherhithe and Bermondsey over the years, sadly not all for the better, as I feel a lot of the character has gone, but I remember the making of King’s Stairs Gardens, and I was sorry to learn about the struggle for it to remain, so I will be happy to sign the petition to save it and I hope it will be successful. My mother’s maiden name was Braithwaite until she married my father in 1937. As such, she was the sister of Charles and Tim and aunt of Peter and Michael, two of my cousins. As a schoolboy, I was often taken to “the Office” in the 1950s, being kept occupied there by being allowed to use their typewriter. When my mother was young, she had been promised something really special as a 21st birthday present. Whatever could it be, she wondered? A watch? Jewellery? A small car? When the special day arrived, the secret was revealed. Her gift was a barge. She named it “Nellie”. I’m not sure what happened later, but I do remember when I used to visit, that a rusting barge resided just below the Office, with hints made that this might have been the remnants of Nellie.